VANCOUVER, CANADA – April 9th, 2019: Sitka Gold Corp. (CSE: SIG) (the “Company” or “Sitka”) is proposing a private placement of up to 15 million units (the “Units”) at a price of $0.11 per unit for gross proceeds of up to $1,650,000 (the “Offering”). Each Unit will consist of one common share and one-half of one share purchase warrant. Each whole warrant will entitle the holder to purchase an additional common share at a price of $0.16 for a period of 2 years from the date of closing of the private placement. This private placement is being offered on a non-brokered basis in the Provinces of Alberta, Yukon, British Columbia, Ontario and such other jurisdictions as the Company may determine in its sole discretion and the Units will be subject to a statutory hold period of four months and a day from the closing date of the Offering. The Company may pay a finder’s fee in accordance with the rules and policies of the Canadian Securities Exchange. The Offering remains subject to regulatory approval. The Company intends to use the net proceeds of the Offering to conduct drill programs at the Burro Creek Gold and Alpha Gold properties and for general working capital. The Burro Creek Gold property is located in Mohave County, Arizona and is situated in an active mining region that includes Freeport McMoran Copper & Gold Inc.’s neighbouring Bagdad Mine and Northern Vertex Mining Corp.’s newly operational Moss Gold-Silver Mine. The 750 acre (303 ha) property is road accessible and is approximately 1.6 km from Interstate Highway 93. Parallel high-tension power lines run adjacent to the property and water rights have been secured, providing the project with excellent infrastructure for future development. (see news release dated September 21, 2018). 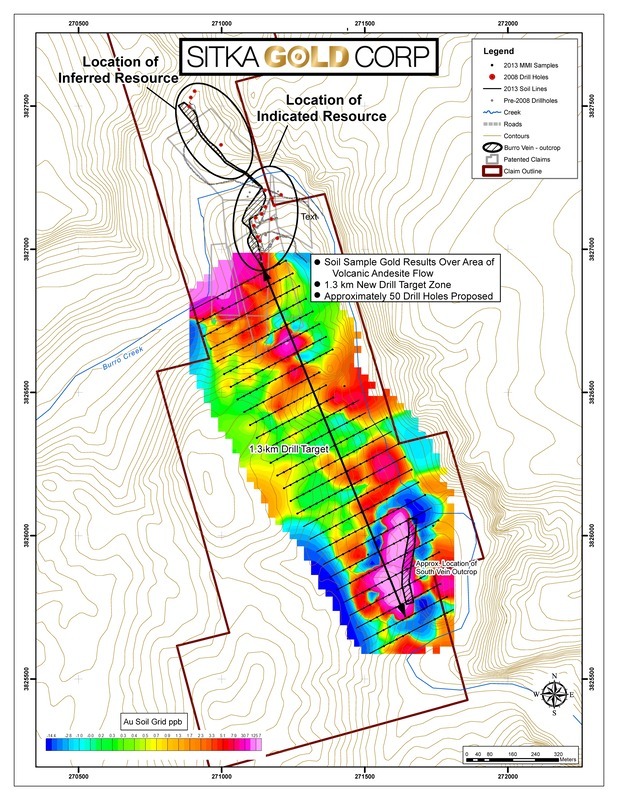 The gold and silver mineralization has been traced for over 1.7 km with vein widths of up to 45 meters and remains open for expansion along strike near surface and at depth. Results from a Mobile Metal Ion (MMI) soil survey returned an anomalous gold and silver trace across the basalt cover that is interpreted to be the buried portion of the Burro Vein over a strike length of approximately 1.0 km (Figure 1). This anomaly provides immediate drill targets to test the continuity of the Burro Vein and potential to expand the known Historical Mineral Resource Estimate. Part of the proceeds from the Offering will be used to drill test this anomaly. 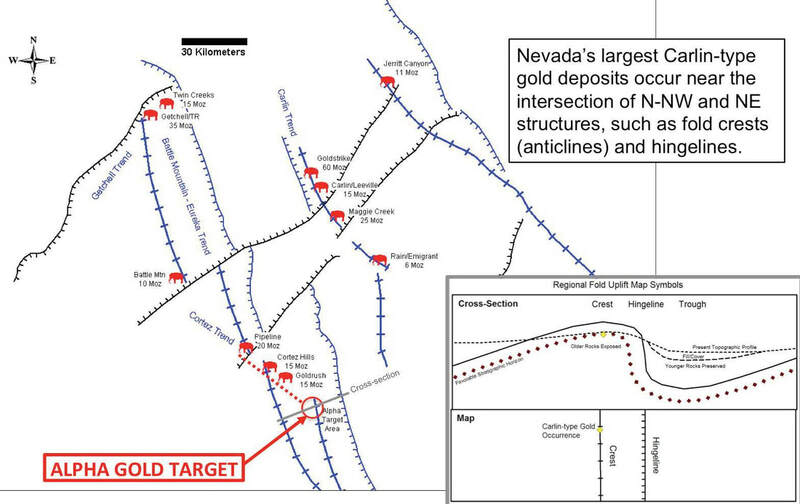 The Alpha Gold property is located in Nevada’s prolific Carlin district and is situated where the Garden Valley Anticline intersects with the projection of the 50-Million-Ounce Cortez-Gold trend (Figure 2). Of primary importance at the Alpha Gold location is that the rocks have been down- dropped significantly by late extensional faulting. Prior to extension, and during the critical 36 - 42 Ma Carlin-type mineralization event, the fold crest at Alpha Gold would have been a regional highpoint among nearby mountain ranges. This is an ideal scenario for producing and preserving a Carlin-type gold deposit, and is exactly what happened at the Pipeline (20 Moz), Cortez Hills (15 Moz), and Goldrush (15 Moz) deposits along the Cortez trend (Figure 3). Furthermore, anomalous gold has previously been identified within the late Devonian carbonates of the Garden Valley Anticline. McEwen Mining Inc.’s nearby Gold Bar gold mine, located on a parallel anticlinal trend, recently went into production. 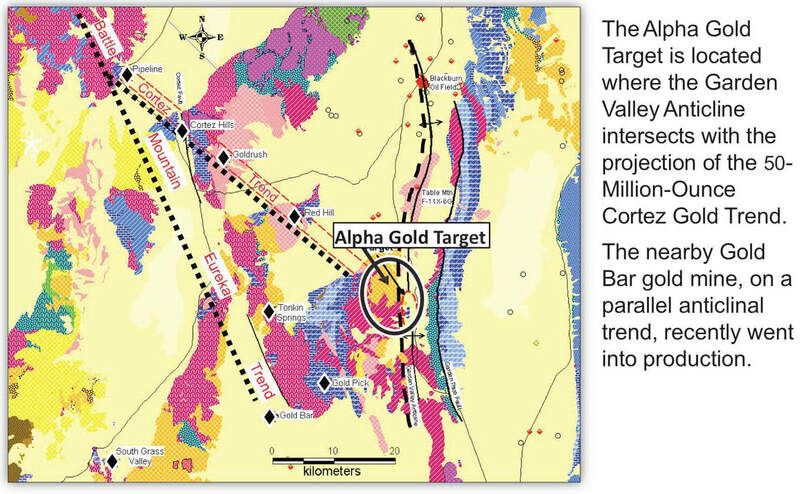 Part of the proceeds from the Offering will be used to drill test the defined targets at Alpha Gold. Sitka Gold Corp. is a mineral exploration company headquartered in Canada and managed by a team of experienced mining industry professionals. The Company is focused on exploring for economically viable mineral deposits with its primary emphasis on gold and copper mineral properties of merit. Sitka currently has an option to acquire a 100% interest in the Adobe Gold property in Nevada, an option to acquire a 100% interest in the Burro Creek Gold property in Arizona and owns a 100% interest in its Coppermine River project in Nunavut and the Alpha Gold property in Nevada. Directors and Management own approximately 36% of the outstanding shares of Sitka Gold, a solid indication of their alignment with shareholder’s interests. ON BEHALF OF THE BOARD OF DIRECTORS OF SITKA GOLD CORP. The technical content of this news release has been reviewed and approved by Donald Penner, P.Geo, Director and President for the Company, and a Qualified Person as defined by National Instrument 43-101. Forward-looking statements and information are provided for the purpose of providing information about the current expectations and plans of management of the Company relating to the future. Readers are cautioned that reliance on such statements and information may not be appropriate for other purposes, such as making investment decisions. Since forward-looking statements and information address future events and conditions, by their very nature they involve inherent risks and uncertainties. Actual results could differ materially from those currently anticipated due to a number of factors and risks. These include, but are not limited to, the expected timing and terms of the private placement, use of proceeds, anticipated work program, required approvals in connection with the work program and the ability to obtain such approvals. Accordingly, readers should not place undue reliance on the forward-looking statements, timelines and information contained in this news release. Readers are cautioned that the foregoing list of factors is not exhaustive. The forward-looking statements and information contained in this news release are made as of the date of this news release and no undertaking is given to update publicly or revise any forward-looking statements or information, whether as a result of new information, future events or otherwise, unless so required by applicable securities laws or the CSE. The forward-looking statements or information contained in this news release are expressly qualified by this cautionary statement. The CSE has in no way passed upon the merits of the proposed transaction and has neither approved nor disapproved of the contents of this press release.